Spring is finally here in the capital, and Beijing's many flower gardens are beginning to bloom. 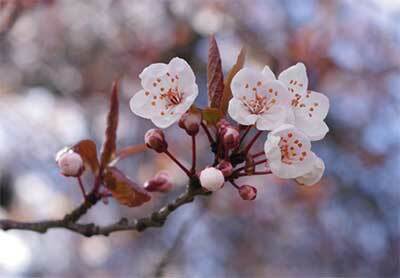 The city has many famous and hidden spots for nature lovers to check out the spring blossoms. From the apricot blossoms at the Temple of Heaven to the pear blossoms of Panggezhuang, here are 14 beautiful spots for spring flowers in Beijing. While few people have heard about the apricot trees at the Temple of Heaven park, the park hosts the largest collection of the trees and blossoms in Beijing. The trees were planted during the Qing dynasty and have matured beautifully over the years. The trees in the park's Apricot Forest will blossom from the end of March to the end of May. The best time to see the apricot blossoms at Phoenix Ridge, or Fenghuangling is early April. At that time, the hills and valleys of the parks are covered with white and pink blossoms and the air is filled with the smell of fresh apricots. The park is also very large and never feels crowded. The apricot blossoms in Phoenix Ridge will be in bloom from the end of March to the end of April. Beijing Botanical Garden has always been famous for its peach blossoms. The garden holds over 6000 kinds of peaches, spanning over 100 acres. In April, visitors can check out more than 40 kinds of peach blossoms, as well as yellow forsythia, plum blossoms, cherry blossoms and white cloves. The best time to go to the Beijing Botanical Garden is between mid April and May. The peach blossoms in Pinggu District first bloom in April. Liujiadian Village has thousands of acres of peach blossoms, enveloped by mountains and spread out alongside a sparkling blue lake. A few places in Pinggu to see peach blossoms are the Sea of Peach Flowers (Taohua Hai), Peach Gardens (Taohua Yuan), Xiaojian Mountain, Da Ling, Xinggong, and Emei Mountain. The peach blossoms are out in Pinggu from mid April to May. Pangezhuang has endless acres of snow white pear blossoms, just like the famous ones in Suzhou. The flowers are bright, and elegant. The best time to see the pear blossoms is from early April to late April. The Summer Palace has beautiful spring scenery, but the best place for flowers is in front of the Hall of Joyful Longevity. In front of the hall there are several beautiful strains of magnolias, that add an elegance to the ancient architecture. The flowers are in bloom from April to May. Did you know that the purple magnolias at Tanzhe Temple are over 300 years old? They are some of the best in all of northern China. The two magnolia trees in front of Pilu Pavilion are especially gorgeous and are well-known for their beauty. The oldest magnolias at the temple are Yulan magnolias, and other breeds of the flower have been added since. The flowers are in season from April to May. The Yulan magnoilas at Dajue Temple are famous for their size, color and fragrance. The blossoms pop against the red walls of the temple. There are thousands of white and pink Yulan magnolias that fill the temple with beauty and fragrance. The flowers are in season from early April to the end of April. Zhongshan Park hosts an annual Tulip Show, in which visitors can stroll down paths through large fields of colorful and fragrant tulips. One of the biggest tulip beds lies beside the Tongzi River at the park of the back. The tulips are in bloom from mid April to mid May. In Jiangshan Park's peony garden, there are traditional royal peonies, seasoned Luoyang peonies, Heze peonies, rare Gansu peonies, Jiangsu peonies and even Japanese peonies. The peonies in Jingshan Park are in season from mid April to late May. Tanzhe Temple's Jietai has more than 20 kinds of lilac trees, some over two hundred years old. When the lilacs are in season, the area is covered in white, lilac and purple blossoms and the smell of lilac is in the air. The lilacs are in bloom from mid April to late May. In spring, Taoranting Park's rose garden blossoms with a huge variety of roses in all shapes, colors and sizes. The park's garden has blue, red, purple, white, yellow, pink and classic red roses. The roses fill the air in the park with sweet perfume from the end of April until June. There is a section of Dadu Ruins Park called Chinese Flowering Crabapple Creek that has a large number of haitang blossoms, also known as Chinese flowering crabapples. The garden is divided into a western section and an eastern section. The western section is best for flowering crabapples, and features golden flowering crabapples and white flowering crabapples. The eastern sections has newer breeds of the iconic flowers. The best time to visit the park is from early April to the end of May. At the end of March, the cherry blossoms come out in Beijing's Yuyuantan Park. The park holds China's largest cherry blossom garden with hundreds of cherry blossom trees. Then, in late April the cherry blossoms fall to the ground filling the park with “snow,” on a warm spring day. The cherry blossoms are in bloom from the end of March to mid April.